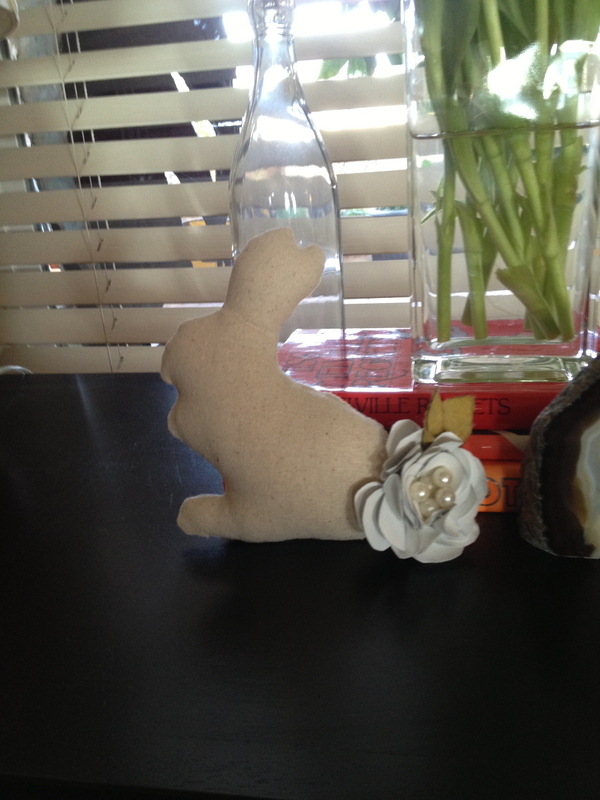 Enjoy my little “Bunny Luv”.I am not a big Easter decorator but I must have a little something about the Holiday around and I saw a bunny like this on another website ,so I took him and made him my own. 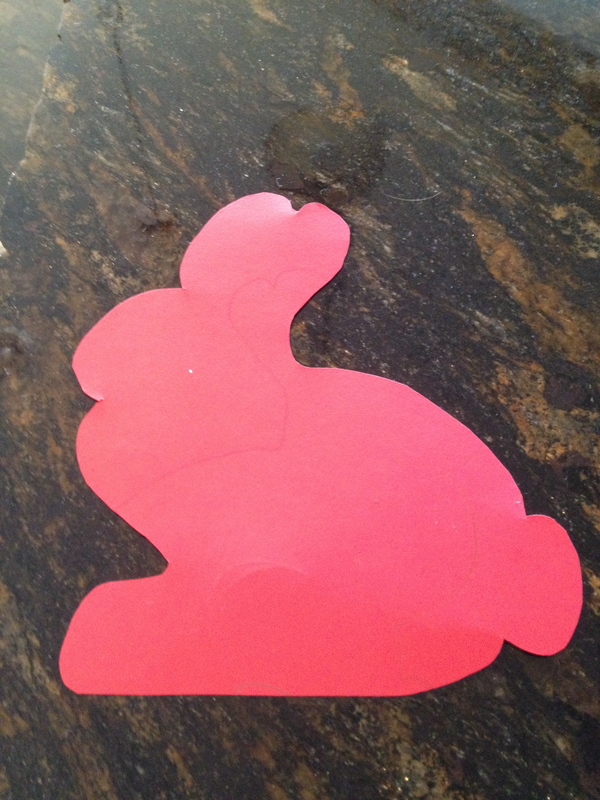 I drew out a silhouette of my bunny on card stock, easy pease really just try it, I wish I was smarter at this blog and I could give you a pattern, (probably type in bunny pattern on search and you will find one) laid it on some material I had and drew him out. Sewed him up on my sewing machine, turned inside out and stuffed with some stuffing. To make him my own I hot glued this little “Rosette” that I made onto his little tail area.Really this is where you could get creative and glue almost anything there. Buttons,pins,crocheted flowers, silk flowers, Oh my it just gets cuter, do you get my drift on what you could glue or sew here. Oh what about a Harley Davidson Pin, that would be cute to man him up a bit.My husband is a Harley rider so always thinking! 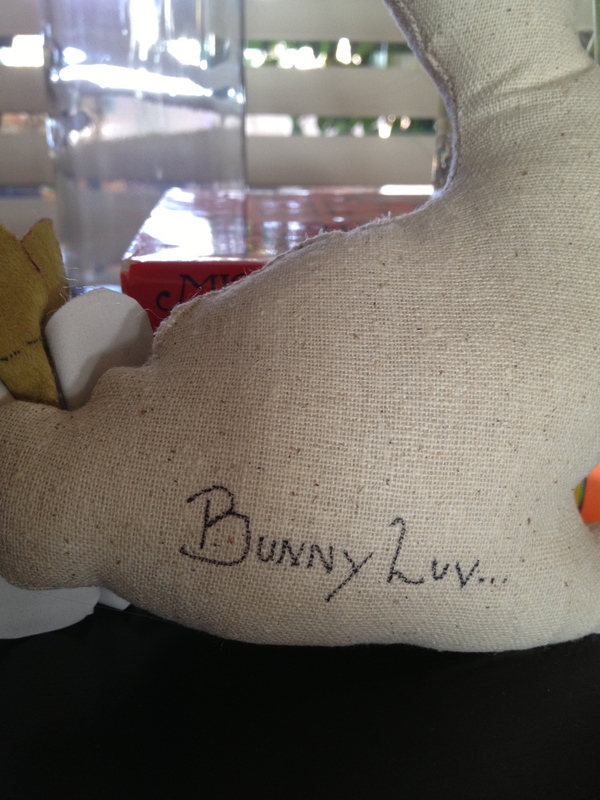 On his back side I took my Ultra fine point Sharpie and wrote this: “Bunny Luv” cause that’s what I thought of after I made him. So there is my Easter decor for now, I hope you love him and can make some of your own, and please share. 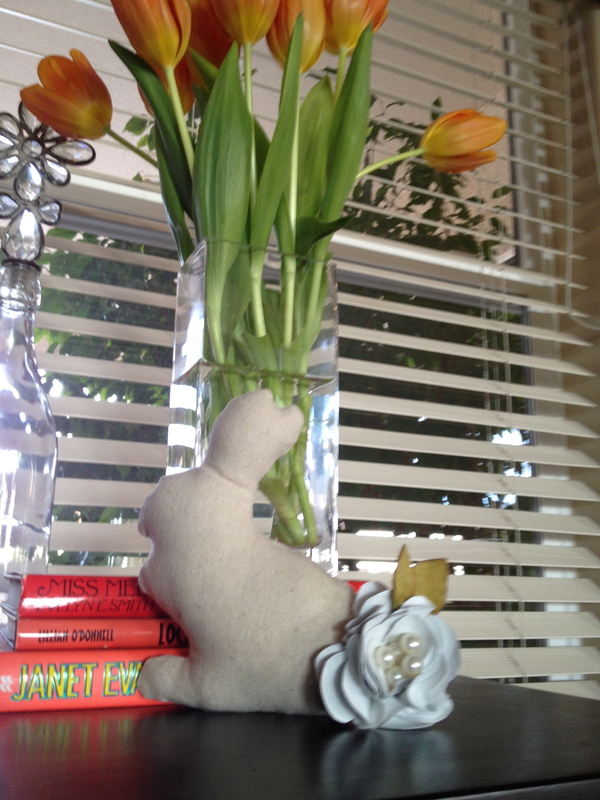 ♥ Use any material to make him your own, Burlap, Checks, Pastels, whatever to match your Decor. I think it makes it special when you think outside of the box and make it your own! Oh my it just came to me, what about Book Pages, you probably can’t stuff him but put it in a picture frame! Ok gotta go and make one.